The lap pool won us. That was brilliant! We had a hotel room and it was very comfortable. The pool around the entire resort looked amazing. Would come back here again. The apartment was well kept, clean and have comfortable beds. The swimming pool is average. Downside of the stay, the lady at the reception was arrogant during check in. Basic but comfortable! Close to beach and amenities. Great location The room was very spacious and well appointed. There was a great little private balcony with lounges for relaxing. Even though it's right in the heart of the action, it was really quiet and the bed was so comfy. Easy to organise a late arrival. Response was good. Goo bed. Sure, living vicariously through your mates' travel posts is fun. But with such an amazing range of hotels in Port Stephens, why not take a holiday and get your own #DoYouTravel masterpieces instead? Let’s be real — pretty much everyone wants to stay in the thick of the action. 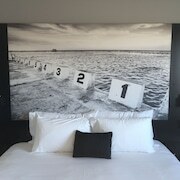 Luckily, you'll find 25 hotels within 5 kilometres of Port Stephens' centre on lastminute.com.au. 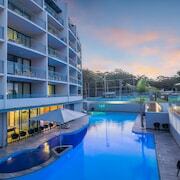 If you want to chillax near the centre, the Mantra Aqua Resort and the Anchorage Port Stephens ought to float your boat. Why don't you also investigate the Oaks Lure and the Nelson Towers Motel? Think about selecting one of the 6 available hotels in One Mile, located 5 kilometres away from the heart of town. Be quick! Some awesome options are the Ingenia Holidays One Mile Beach and The Oasis at One Mile Beach. Visit Gan Gan Hill Lookout for an excellent view of the region, and to take some pictures of the natural surrounds. 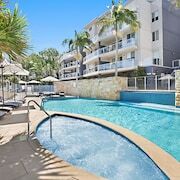 The Nelson Bay Breeze Holiday Apartments and Nelson Bay Bed & Breakfast should be at the top of your accomodation hit list if you're looking to stay nearby. Bring all the family on a refreshing walk through the great outdoors at Tomaree National Park. Fortunately, Port Stephens Motel and The Nelson Resort are nearby, so you can stop by and see it as often as you'd like! Budget accommodation no longer means rats in the walls. Port Stephens Treescape is a seriously good option if you're looking for cheap and cheerful. 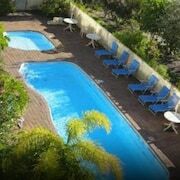 Or, suss out Gateway Lifestyle Birubi Beach. 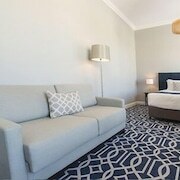 You might also like to check out the rooms at the Ramada Resort Shoal Bay or the Boathouse Resort Tea Gardens. The Ramada Resort Shoal Bay is 7 kilometres away from the centre of Port Stephens, and the Boathouse Resort Tea Gardens is 8 kilometres away. More options include the Beaches Serviced Apartments, 5 kilometres away, and the Shoal Bay Beachclub Apartments, 6 kilometres away. But don't just limit your travels to Port Stephens. Take some time to check out some of the fabulous sights and activities that the wider North Coast region has to offer. Nature lovers should visit some of Port Stephens' amazing beaches and coastal plains. A few other gotta-sees to whack on your list hit are art galleries and craft workshops. Those with a serious appetite for adventure might also like to try a little hiking and horse riding in this corner of Australia. Looking for things to do? Consider spending some time checking out the Bulahdelah Golf Club and Bulahdelah Court House. You'll find them in Bulahdelah, 40 kilometres to the north of Port Stephens. 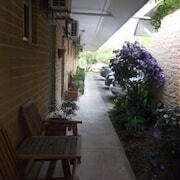 If you're keen to visit Bulahdelah, look into the rates at the Bulahdelah Myall Motel and The Lady Jane Motor Inn. Or, you could consider staying in Chisholm, 45 kilometres to the west of Port Stephens, where you'll find The Villa - Country House Retreat and Studio@the Close Morpeth. If you're staying in Chisholm, make sure you visit the Hunter Region Botanic Gardens and Maitland Gaol. Dog-tired after your flight? Need somewhere half decent to crash but think 25 kilometres from Williamtown Airport to the centre of Port Stephens sounds just waayyy too far? Don't stress. The Mercure Newcastle Airport is pretty close and has your name all over it!